The "black gold" rush has been rejuvenated lately, thanks in large part to unconventional drilling in North America and deepwater finds off the coast of nearly every continent on earth. Now that natural gas has found its way into the mix on a meaningful scale, exploration budgets have never been higher. Risk-averse investors who are still looking for energy exposure would be wise to follow the deluge of money set to pour on the companies wielding the picks and shovels. By publicized reward, I mean that upstream companies, at least those that are publicly traded, offer fairly detailed insight into their future spending plans. There are very few industries that have an advantage like this, where customers are outspoken regarding the amount of cash they are bringing to the store and that they plan on spending all of it. Because of the inherent risk involved during the exploration and production phases -- think Deepwater Horizon in 2010 or McMoRan Exploration's lack of success at its Davy Jones well -- companies like Halliburton and Ensco are wise choices in my opinion. There are many reasons why both of these companies are part of my portfolio and why they, or their peers, should be a part of yours. As traditional energy pockets dry up, new frontiers must be explored. One of the hottest frontiers right now lies thousands of feet below the ocean's floor, underneath 7,500 or more feet of water. These ultra-deepwater ventures are costing exploration companies like ExxonMobil and Royal Dutch Shell over $600,000 per day just for drilling companies like Ensco to operate. Why do I like Ensco compared to some of its peers? Because it has the youngest ultra-deepwater fleet in the world and the second-youngest deepwater fleet behind Seadrill . Add up all of its rigs, including its toddler-aged fleet of premium jack-ups, and Ensco has the second-largest fleet with 74 rigs behind only Transocean's 99. I also feel compelled to mention the fact that it was just voted the top offshore driller in customer satisfaction by Energypoint Research for the third straight year. While this award might have been brushed off four years ago, customer satisfaction and safety have been a point of emphasis since BP's Macondo well disaster, which has cost it nearly $40 billion in charges and commitments to date. Aside from the depths of the great blue seas, tight oil and natural gas formations around North America have been a boon for upstream producers. And, until lately, the same could be said for land-based equipment and service companies. 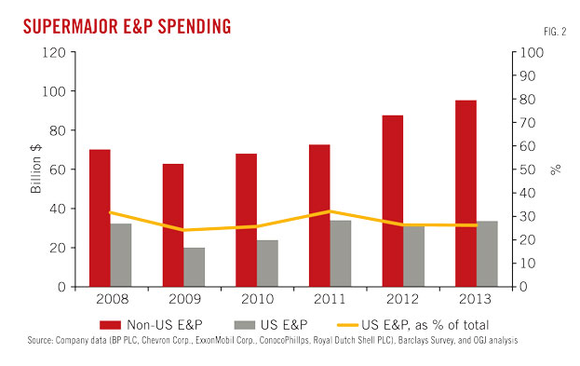 Halliburton and peers can thank supply outstripping demand for the recent slowdown. Infrastructure and end users simply weren't prepared for what hit them. As a result, the price of natural gas plummeted in the States and rig operators closed up shop around the country. Fortunately, that imbalance is on the mend and expectations for an increase in land rigs means that these companies should be back in business. I believe Halliburton is sitting in the pole position due to its industry-leading experience with hydraulic fracturing. Its "Frac the Future" initiative offers producers a full suite of clean and efficient drilling equipment, coupled with the knowledge gained from operating in some of the trickiest formations drilled to date. This expertise has also been leveraged in the first unconventional wells in countries like Argentina, Australia, and the site of the next potential black gold and gas rush -- China. Looking for a double dip? Investors might be able to look no further than National Oilwell Varco . If this were the armed services, NOV would most certainly rank very highly in the Marine Corps due to its amphibious business model. You see, National Oilwell Varco provides equipment and services for drilling rigs both on land and at sea. Thankfully for NOV, most of the offshore rig operators aren't sporting a fresh rig set like Ensco. This means repairs and upgrades are likely, especially as drilling environments become incrementally harsher. Due to its integrated offerings, the company tends to lock up clients for life. As for its foot soldiers, NOV experienced the same fate as Halliburton recently. The slowdown in land drilling put a temporary dent in its operations, but the inevitable return to "drill, baby, drill" is right around the corner in my opinion. After all, it is rarely wise to bet against Warren Buffett, who reported owning over 5.25 million shares in the fourth quarter of 2012. The bottom line here is that spending from the upstream segment will show the U.S. government what trickle-down economics is all about. In this case, exploration and production companies simply cannot grow at a pace suitable for investors without the help of the companies mentioned here and their peers. Now it's up to you to choose which company fits your investment style and portfolio best. Domestic oil and gas service companies have taken a hit due to a slowdown in the natural gas drilling boom of the last couple of years. As this market looks to rebound, investors would be wise to consider Halliburton, one of the top companies in the business and one of those most in tune with the domestic market. To access The Motley Fool's new premium research report on this industry stalwart, simply click here now and learn everything you need to know about how Halliburton is positioning itself both at home and abroad. The article A Lesson From Energy in Trickle-Down Economics originally appeared on Fool.com. Taylor Muckerman owns shares of Halliburton and Ensco. The Motley Fool recommends Halliburton, National Oilwell Varco, and Seadrill. The Motley Fool owns shares of National Oilwell Varco, Seadrill, and Transocean. Try any of our Foolish newsletter services free for 30 days. We Fools may not all hold the same opinions, but we all believe that considering a diverse range of insights makes us better investors. The Motley Fool has a disclosure policy.